You can volunteer on a Sports coaching project in Vietnam without any previous experience of coaching, although, of course you’ll be very welcome if you do have any experience too. 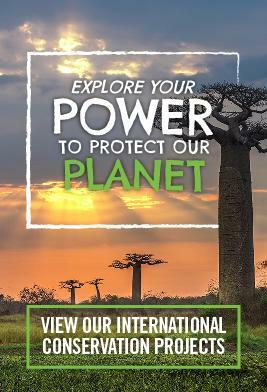 Volunteers are welcome no matter what stage of life they are at - during a gap year from education or a career break or even as an alternative holiday. All we ask is that you have a passion for sport and a desire to help others to develop their own sporting ability. 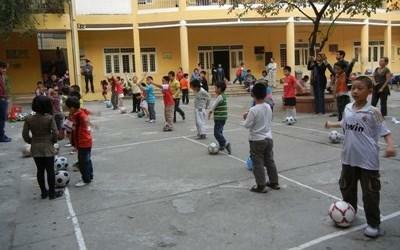 Volunteers work in either a primary or secondary school near Hanoi, coaching students aged from 6 - 18 years old. The number of students in each sports class varies from about 30 -55 students. The lessons usually last 40 minutes and take place in the school's yard. Each sports class receives two sessions a week. Football and basketball are the most popular sports; however, teaching new sports such as volleyball and rugby may be taught in the summer. You also have the opportunity to teach yoga and core strength classes, as well as arrange mini sports days for the children. Let us know which sports you are most interested in when you apply and we will match you to a suitable school. The main emphasis of the School Sports projects is to get as many children involved as possible. Offering sporting activities in this way means children become fitter and healthier, as well as giving them a sense of belonging to a team of people with a common goal. This in turn has positive benefits for the wider society because the youth in the local community are engaged in wholesome activities, which give them structure and purpose. Volunteers will work alongside local teachers who will be introduced to them during their placement induction. The volunteer’s presence in the school also gives students the valuable opportunity to practise their English. Volunteers usually start off as the sport teacher's assistant and in some instances may lead the class in an activity. As the placement continues, depending on your ability and enthusiasm, volunteers may be given a more prominent role within the class. You will also spend time providing general assistance for the teachers, such as helping out in the feeding area and the life skills room. 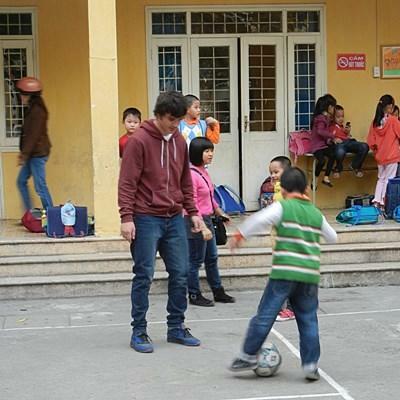 This project offers you a real chance to use your sporting talents whilst interacting with Vietnamese teachers and students, and also playing a role in the local community. Your efforts are sure to be greatly appreciated and you will find the development you see in your students to be incredibly rewarding, whilst at the same time knowing that you are a part of a bigger network of people who are developing Vietnam's sporting future. Volunteers will stay with a local host family or in a Projects Abroad rented volunteer house based on the location of their placement.